“In tennis, always one guy has to win and one guy has to lose,” Roger Federer said after his straight-sets loss to Stan Wawrinka on Tuesday at Roland Garros. 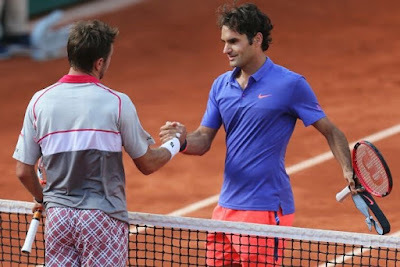 Switzerland was guaranteed a man in the Roland Garros final four this year, but eighth seed Wawrinka nabbed that spot, beating compatriot Federer 6-4, 6-3, 7-6(4). Going into their quarter-final clash, Federer lead their ATP Head to Head series 16-2. Tuesday’s loss was the first the World No. 2 had ever suffered to Wawrinka at the Grand Slam level, but Federer had nothing but positive things to say about his fellow Swiss and friend. “We know he can do this,” he said. “It's just nice for him now, even talking for him, to string it together on a big occasion like this at the French Open where I always thought he'd have his best chance to do well. Unable to convert any of his four break point chances in the two-hour, nine-minute match, Federer’s quarter-final loss was the first time he did not break serve in a Grand Slam match since falling in the fourth round to Max Mirnyi at the 2002 US Open. Federer won the title at the TEB BNP Paribas Istanbul Open and had a runner-up showing at the Internazionali BNL d'Italia (l. to Djokovic) before ending his clay-court season with a quarter-final exit in Paris. He now looks ahead to grass, a surface on which he holds a 131-19 record. “I’m looking forward to what's coming ahead now,” he said. “There is nothing really positive about losing today because I don't need the extra days, but I will use them with my family and have a great time with them and recover my body.